Yes, that's right. I might be a criminal. I might have inadvertently broken a law. Not only that, but, as it turns out, I might also have been breaking this law continuously for 20 years. Here's my story: Twenty years ago, someone offered me an antique bird's egg collection she'd got at a local auction some time earlier and no longer had reason to keep. Having heard about the "museum-in-a-bag" I drag around with me when I visit schools, she'd thought it would be right up my alley. She was correct. The collection was obviously old. Really old. 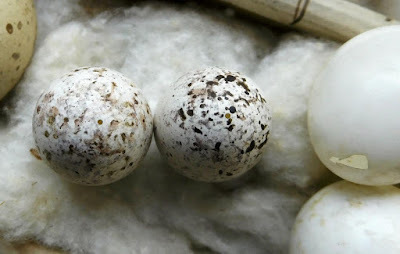 The soft cotton batting that protected the blown egg shells was flecked with impurities and had browned with age. The names written neatly with fountain pen on the papered edges of the wooden box dividers had faded. Even some of the eggs had faded. The box itself was charmingly ancient. 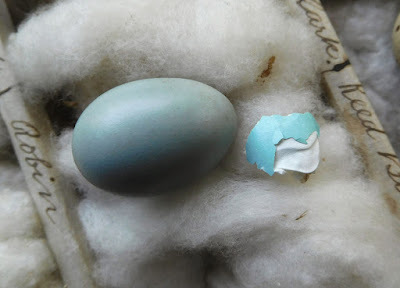 The collection's faded robin egg compared to a piece of a fresh one. Even the names suggested times of yore. Though many of the eggs were labelled with common names we still use today, such as "Crow" and "Robin," (albeit, some with creative spelling, i.e. "Meddallark" for meadowlark), others bore nicknames that have long since been replaced, i.e. "High Hole" for flicker. 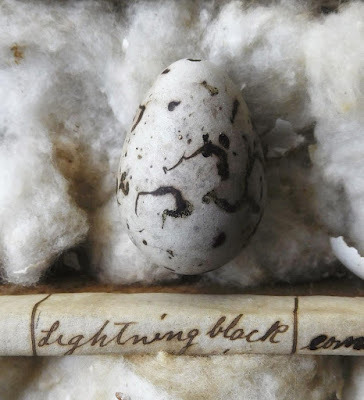 Yet others seemed to have been invented by the collector, such as "Purplest Swallow" (for a Purple Martin egg), and my personal favourite, a grackle egg that's labelled "Lightning Black Bird." "High Hole" is an old name for a flicker woodpecker. "Lightning black bird" is a made-up name for a grackle. Because of all these things, I'd always been sure that the collection was really old – which at first was just an element of its charm. 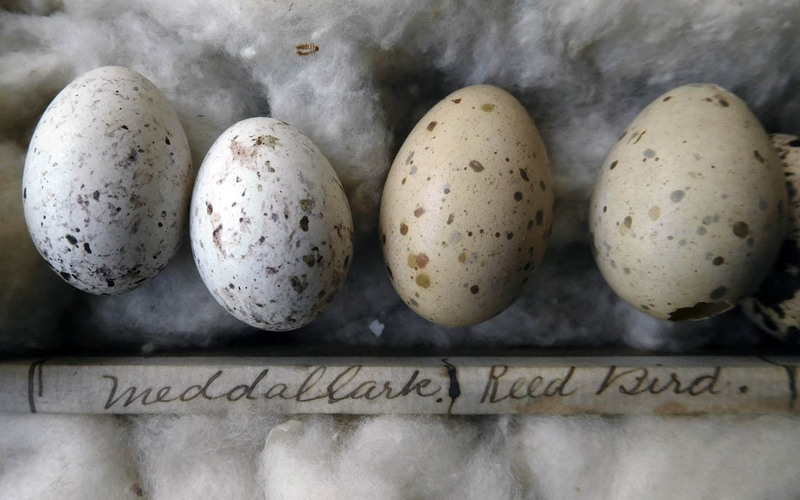 But then, while researching The Tragic Tale of the Great Auk, I discovered that it has been illegal to collect, purchase, or possess [my italics] bird eggs since 1916 when the North American Migratory Bird Treaty was jointly signed by Canada and the U.S. I did some digging and found out that if I could prove that my egg collection predated the treaty, I could keep it free and clear. Otherwise, it was possibly illegal for me to own it. Suddenly the actual age of the collection mattered. But I had no proof of its antiquity. For all I knew, it could have been fifty years old or a hundred and fifty. The Tragic Tale of the Great Auk. The North American Migratory Bird Treaty is a cornerstone of world conservation efforts. In the early years of the 20th century, wild bird numbers were rapidly declining. They were in trouble. For centuries, there had been unregulated slaughter of native birds – for food, for taxidermy, for feathers, or just for fun. 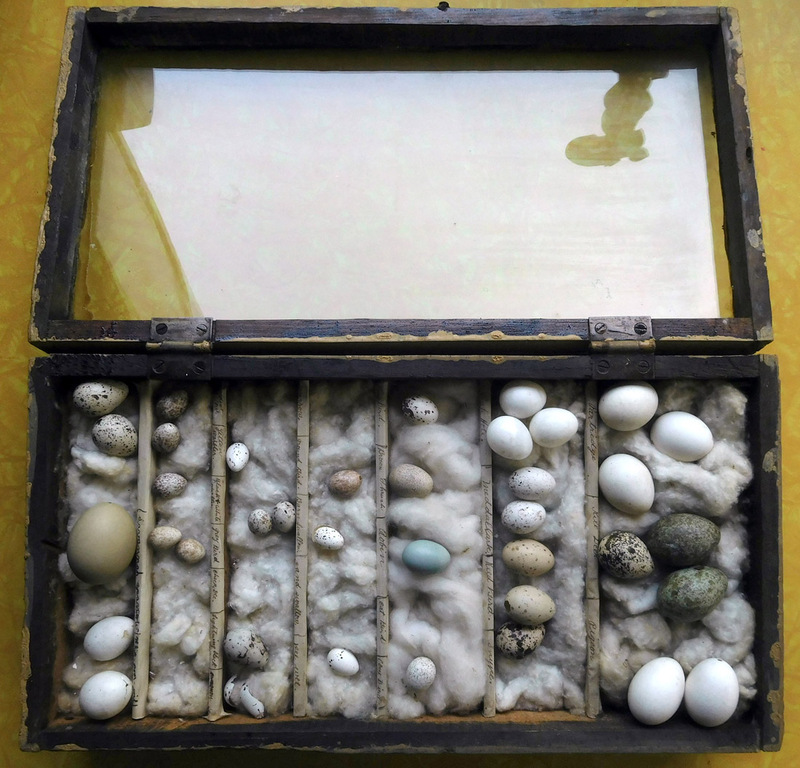 Eggs, too, were collected, sometimes for food, but also for fun: on both sides of the Atlantic, egg collecting was a popular hobby for more than a hundred years, which meant that even the eggs of the smallest songbirds were considered fair game, eggs so tiny they would be suitable only for a doll's breakfast. 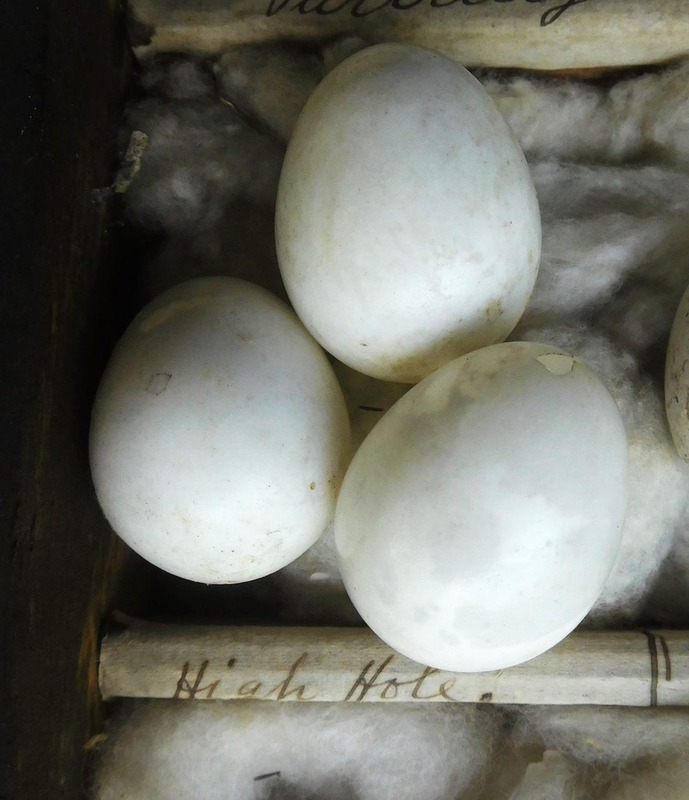 The pastime was so common throughout the 19th and early 20th century that there was a brisk business in bird egg trade, sales, and auctions as collectors, or oologists, tried to complete their collections. Naturally, the eggs of the rarest birds were the most exciting acquisitions. 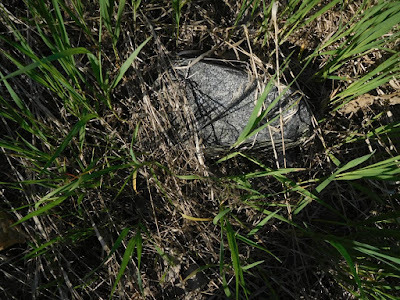 I never would have found this Song Sparrow nest. Granted, egg collecting could be challenging. 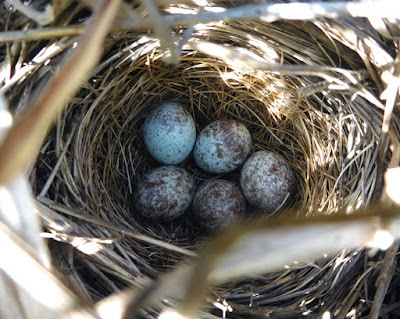 First a nest had to be located and once it was found it had to be watched to gather the eggs at the optimum time – within a few days of being laid, so they could be "blown" while the yolk and albumen were still liquid. Blowing an egg was a delicate operation. A tiny hole was first drilled through one end with a needle. A slender pipe was then carefully inserted into the hole. Blowing into the pipe forced the contents of the egg to dribble out around it, (and presumably down the blower's fingers!). not so expertly pierced before being blown. Egg collecting could also be dangerous. In 1913, a man fell 200 feet to his death while trying to collect eggs from a Peregrine Falcon aerie. If two young women collecting wildflowers at the base of the cliff hadn't stumbled upon his body by accident, he may never have been found. Another man, Francis Birtwell, climbed 75 feet up a tree to reach a nest while honeymooning in New Mexico. On his way down, a rope looped around his neck, strangling him while his horrified bride watched from the below. 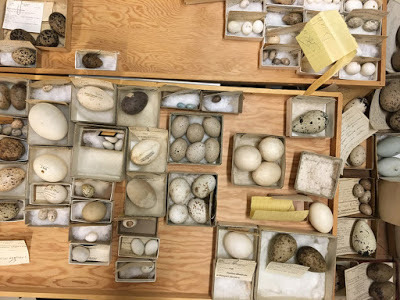 Many egg collections, sometimes containing thousands of "sets" of eggs (eggs from a single nest) were eventually donated to museums once the Migratory Bird Treaty came into effect. Because the oologists or "eggers" often kept detailed records of where and when the eggs had been collected, their collections are now invaluable to researchers, particularly in tracking changing nesting times, which is critical information in these times of climate change. Which brings me back to my possibly criminal act. Since I was unable to prove that my collection predated the treaty, and I had no intention of destroying the collection, (besides which, they're awkward things to store), I took the museum route. 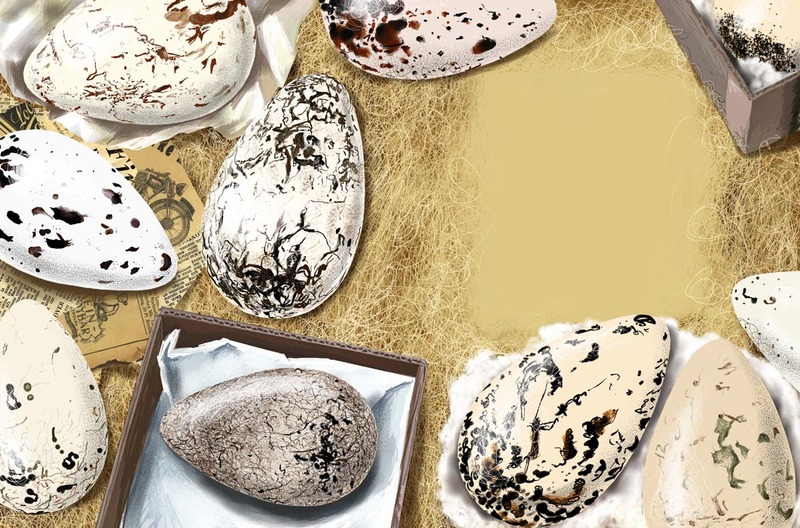 I called Mark Peck at the Royal Ontario Museum (see here for my post about the ROM's Great Auk) to see if I could donate my collection to their own collection of almost 12,000 eggs. Sadly, because mine had no provenance (documented chronology of ownership, etc. 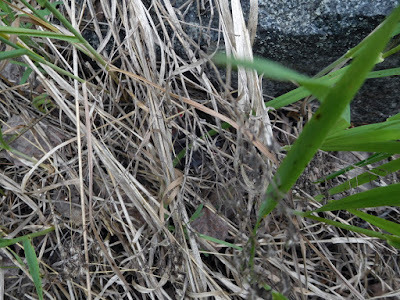 ), nor any data about where or when the eggs were collected, they can't be used for study. But they will have a home in the ROM's extra egg cabinet. And I can stop worrying about the RCMP breaking down my door in the middle of the night. 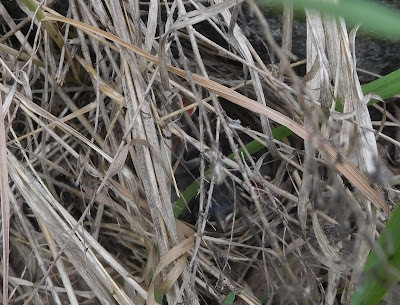 And, oh yeah, I went back to the Song Sparrow nest eight days later. All five eggs had hatched. No? Here's a closer view. And here I temporarily moved the grasses aside. 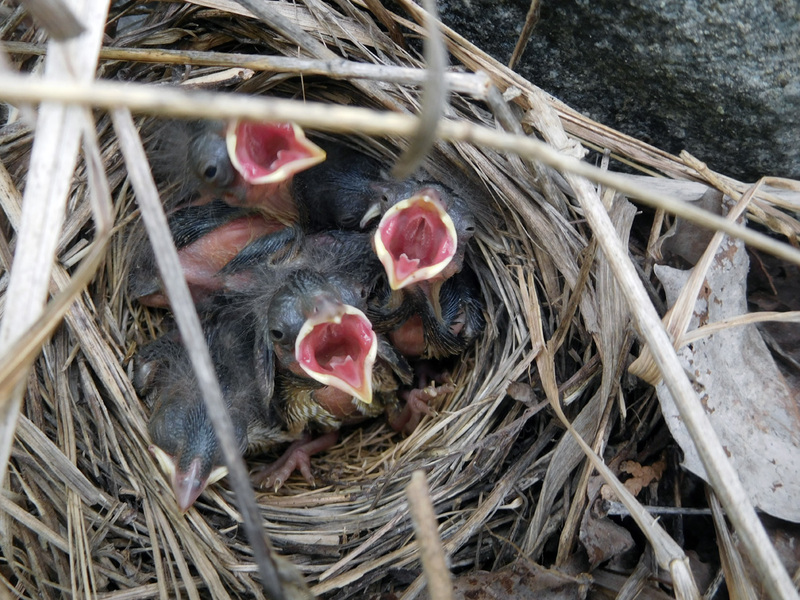 Step 5: Submit your data online and contribute to Canada's national nest records database! Could There Be a Volcano Near My House? Well, it depends on where you live. There are certain areas on the planet where you might want to set up sensors. Most of those are out in the Pacific Ocean. If your house is in North America, I’m going to say you’re basically volcano free. Unless you’re on the west coast. And only a handful of volcanoes have been active in North America in the last 150 years. Here’s why. Deep beneath the Earth’s hard crust is a core of rock so red hot that it has melted. It’s a little like the melted mozzarella in a cheese stick. Except that in the Earth, the molten rock is swirling and rising up, unlike the cheese. This molten rock breaks through the crust mostly at natural seams where continents meet (tectonic plates, actually). That’s why we find some on the west coast of America. Earth’s crust is about 30 km thick on the continents. It would take you just over 6 hours to walk that distance. In some places on the ocean floor Earth’s crust is thinner, about 5 km thick. At hot spots in the thin crust, molten rock breaks through and spews out onto the surface as lava. As the lava cools and builds up on itself over years and years, it makes a mountain. Because the lava keeps flowing up and out of the Earth in that mountain, we call it a volcano. The Hawaiian Islands were formed by lava bubbling up over many thousands of years and cooling into island-sized mountains. The tallest of the Hawaiian Islands is actually several hundred metres taller than Mount Everest, if you measure from its base at the bottom of the ocean. Scientist believe that the hot spot where lava is bubbling up stays in one place as the crust slides extremely slowly over top of it. This is why there is a whole chain of islands in Hawaii. As the crust moves over the hotspot, a new island starts forming. Is it dangerous to live near a volcano? Lots of people live near a volcano. Does that sound crazy? I mean, when it erupts, a volcano can spew boiling hot rock chunks as big as a refrigerator high into the sky. It can send 1200 °C lava flowing down the hillside for many kilometers. The hot gases and ash that get blown out with the melted rock can spread clear around the globe, causing destruction in its path. When Mt St Helens in Washington erupted in 1980, it caused a medium-sized earthquake and spread ash all the way around the world over two weeks’ time. Besides the many bridges, homes and roads that were destroyed, 57 people were killed by the eruption. When the Eyjafjallajökull volcano in Iceland erupted in 2010, planes could not fly in all of Europe for 8 days because of the ash cloud. Safety officials were afraid the hot ash would damage engines and make the planes crash. Flights in Europe were grounded because of ash several more days over a month. Why do people even live near volcanoes? The thing is, volcanoes don’t erupt violently that often. Even the world's most active volcano is just slowly leaking lava down its sides and burning surrounding neighborhoods to the ground. That is the Kilauea volcano in Hawaii and it has been erupting constantly for 35 years. But the Yellowstone volcano only erupts every 700,000 years. Volcanoes tend to be in very lush environments. Sometimes the environment is lush because of the volcano and all the minerals that lava brings to the surface. That may have attracted people’s ancestors to the area, and they stayed. Some people live near volcanoes because it is affordable—cheap homes because they risk destruction. In many cultures, volcanoes are thought to have spiritual power or importance. They are expressions of the gods, and bring luck and prosperity as well as destruction. Some people may live near volcanoes for that reason. Scientists live near volcanoes so they can study them. 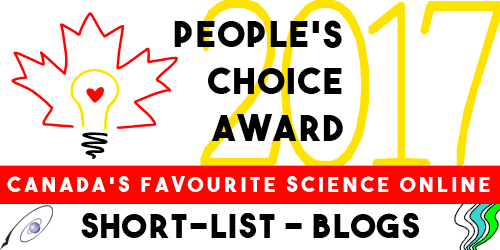 It’s extremely dangerous, and there are many stories of volcanologists dying at work. 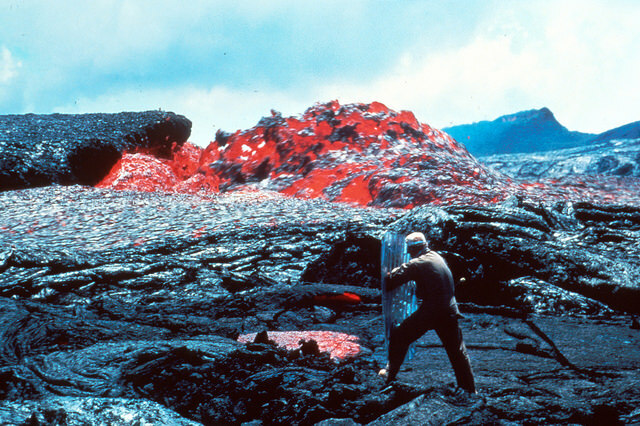 A USGS department geologist takes the temperature of a lava flow on Mt. Kilauea in 1984. Public domain. Can I visit a volcano safely? There are about 1,500 volcanoes in the world that could be active. Only about 500 have erupted in recorded history. In Hawaii, you can tour the lava tubes created by lava flows. 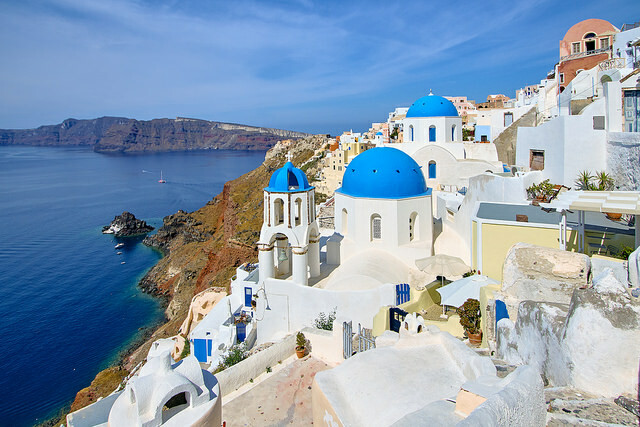 You can visit the Greek island of Santorini that is still an active volcano with 13,600 people living on it. It has had very small eruptions that build up its sides over the last 70 years. And there are at least 1000 others you can climb on. Take a look at the list of volcanoes and think about which one you’d like to visit. Do Fans Actually Make You Hotter? Open the fridge on a sweltering hot day and that blessed blast of cold air can make you want to stand there all day. “Close the fridge door!” your parent says. Ugh. No relief. So how can you cool off? Fans, air conditioners, and a shower can all help, but which one is best? Some people say fans actually add more heat to a room. The important part about a fan is that it moves the air, which speeds up evaporative cooling on your skin as it dries up sweat. A fan doesn’t drop the temperature in the room, it drops the temperature of your skin. The air passing over our sweaty skin evaporates the water. That change of state, from liquid to gas, requires heat, and that pulls the heat away from our bodies. Besides, some people have crunched the numbers on the heat output from a fan motor and it’s just not very much. What about fanning yourself instead of using a motor? Motors create heat. So does exercise. Fanning yourself can create more heat than cooling. 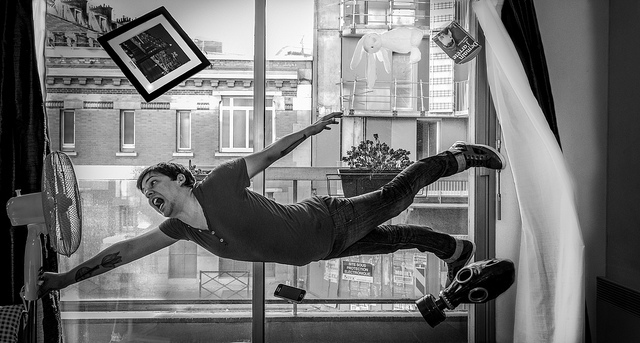 The trick is to find how little fanning you can do to get just enough of a breeze. Or, be like those ancient royalty in movies and have someone else fan you. Just don’t let them work too hard or the heat they generate will make you even hotter! Air conditioners have motors. Touch the side of an air conditioner and you can feel that its motor is putting out heat. Do they make the room hotter? The air conditioner is actually cooling the air, not just moving air around so that you feel cooler. Like your fridge, it moves that heat from inside to outside. A fridge makes a room hotter but makes the air inside of it much cooler. The difference is that an air conditioner moves the heat outside of the room and a fridge just moves it outside the fridge, into the room. Though most of the heat an air conditioner removes is sent outside the house, the part of the unit inside the house does give off some heat. So yes, an air conditioner does add heat to a room. The reason it still cools a room is that it removes a lot more than it adds. The net result is a temperature drop. What about eating ice cream, can that cool you off? Eating and drinking cold stuff when you’re overheating is a really good idea. But even if you’re sitting still, digestion will create heat as the calories are converted by your body. The reason eating cold food lowers your temperature is that the cold has more effect than the conversion of calories does. If you want to cool off even more, get away from other hot bodies, close the curtains so the sun isn’t heating things up, wet yourself down with a cool cloth, and close down the electronics. A computer can generate 100 watts of heat with light use, and even that smart phone is heating things up. Want to get maximum cool with minimum heating? Plant a tree and get some shade. Photo by John Lee Maverick, “Maybe we should stick to Low Speed” used under CC BY-ND 2.0 license.